A lovely way to remember a loved one who has passed away. 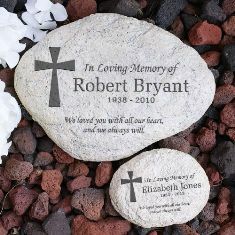 This Memorial Garden Stone is made of durable resin and has a look of stone. Free Engraving is included. Measures 11" W x 8" H x 1 1/2" D. A smaller Memorial Garden stone is available and measures 5 1/2" W x 4 1/4" H x 1 1/4" D. Can be used inside or outside. Will be engraved with any name and date below.